This skin condition can look worse than it is and also carry with it a very sour smell on your newborn’s head. All of my children had this condition and for my cases, it carried an awful smell. One of the things I love about newborns is that newborn smell. I love the sweet aroma I get when I kiss my little ones or hold them close. It is honestly one of my favorite smells. When my infants got cradle cap, the first this I noticed was a sour smell to them even when they were clean. It was caused by the overgrown scales on the top of their heads and I wanted to get rid of it. I looked at options on the market for treating cradle cap and began to read the ingredient labels. I was shocked to find that many, if not all, contained some type of chemical, dye or perfume in them. I refused to put any of those things on my brand new baby. I wanted to find a natural way, organic if possible, to treat it. I started using organic coconut oil on my skin after I had a reaction to a stretch mark product I had bought at the store. The product contained a scent and was comprised mainly of mineral oil which was preventing my skin from breathing. I broke out in a heat rash all over my already itchy pregnant belly. After reading about all of the benefits of coconut oil, I started to use it as an all over moisturizer. I loved the way it made my skin feel and I felt good knowing it was an all natural and organic product. I didn’t want to expose my skin to any harsh chemicals. I eventually added some other beneficial, organic ingredients to my coconut oil and used it to treat the cradle cap. I wasn’t sure how well it would work but I wanted to give it a try. In just a few days of applying Coconut Baby to my newborn’s head and combing away the dry skin flakes, my baby was free of cradle cap and I could enjoy inhaling their beautiful scent. If you would like to see the product I used click HERE. It is so important to read labels to find out what you could potentially be exposing your baby’s skin to. Be careful. Look for simple, easy to read labels with ingredients that you can pronounce and know exactly what they are. Try to use organic and all natural products. Our little ones are so precious. Let’s make the best decisions we can on what products we use on them. 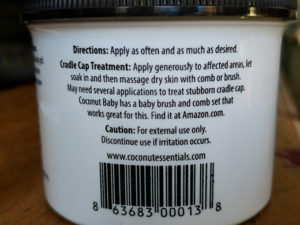 Find Coconut Baby- organic, all natural cradle cap treatment on CoconutEssentials.com. Previous Previous post: How can I safely treat Cradle Cap in my infant?